Years ago, the only ammo options for the civilian import AK47s that flooded the market in the 80’s and 90’s were the surplus spam cans from the various countries that used the 762x39. Now, and since early the 2000’s, that market has changed dramatically with the debut of commercial steel cased ammunition manufacturer Wolf. 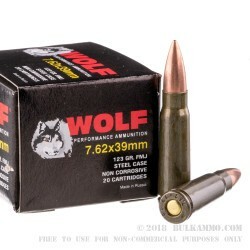 Wolf offers bulk 7.62x39 ammo with a 123-grain full metal jacket bullet, non-corrosive, non-reloadable Berdan primed, steel case with lacquer coating to increase protection from the elements. These rounds also have what Wolf calls the “Polyformance” coating, which helps with feeding and all parts of the cycle of operation. 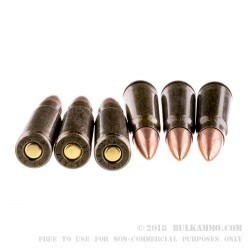 These 7.62x39 cartridges have a muzzle energy that hits hard at 1524-foot pounds and a muzzle velocity of 2362 feet per second. They come in packs of 20 rounds for easy transport and bulk packs for stocking up! Get yours today! 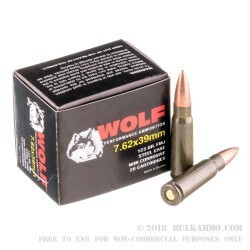 Russian ammunition manufacturer Wolf has been making the commercial 7.62x39 caliber round affordable since they entered the market in 2005. After their debut, they have kept that spot as the front runner in the quality steel-cased ammo market. Currently, they offer multiple calibers and multiple bullet types (FMJ, SP, HP, etc. 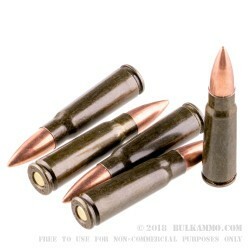 ), reloading supplies, and brass cased ammo as well.